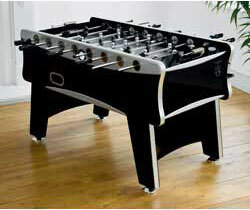 Argos call it a ‘soccer’ table, I call it a football table, wouldn’t you love to have one of these at home or in the office? Tournament quality, 16mm solid steel player rods. Ball bearing rod brushes for fast player action. Plated robo style players for better control. Stainless steel ball entry cups. Stainless steel goal and ball return edge trims with metal bead style scorers.